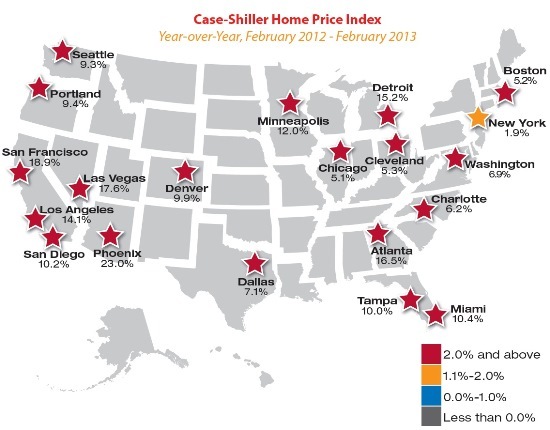 The Case-Shiller 20-City Composite Index was recently released for the month of February. This chart showed a year-over-year increase of 9.3% across the 20 cities. This represents the highest year-over-year increase since May 2006, and for the past 2 months all 20 cities (including Phoenix) have posted year-over-year gains. I am sure most of you remember the Phoenix Real Estate Market from 2006. This was a market driven by investors and ridiculous loan financing programs. Fast-forward seven years and we find ourselves in an eerily similar real estate market. The main difference being the tightened guidelines for financing, but what happens when rates start to go up? Will people still be able to afford these ever rising home prices?